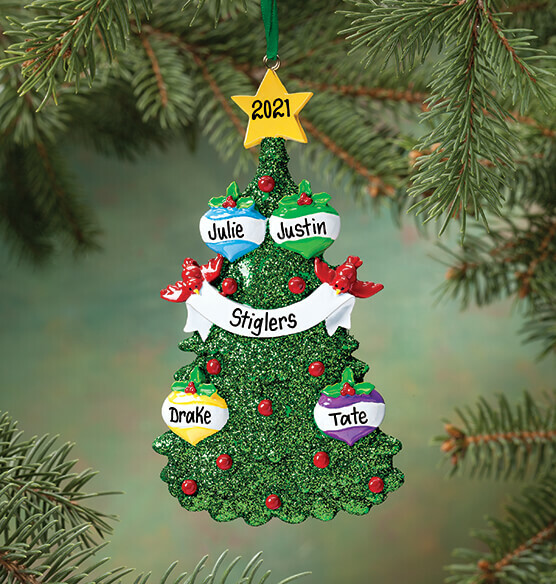 Make this sparkling tree ornament your family’s own ... personalized for a custom, dated treasure. Specify first names; limit 8 letters/spaces each. Specify last name; limit 12 letters/spaces. Specify year; limit 4 characters. We'll arrange for you. Resin. Family of 3, 2 5/8" wide x 4 3/4" high; Family of 4, 2 3/4" wide x 5" high; Family of 5, 2 3/4" wide x 5 1/4"high; Family of 6, 2 7/8" wide x 5 1/4" high; Family of 7, 3 1/4" wide x 5 1/2" high. Christmas Tree Ornament! Love, Love! They are very pretty and the writing is perfect! I gave them to friends for Christmas and they loved them also. I can't think of a single thing that isn't great about them. They were exactly what I needed and wanted and I was very impressed! Shipping time was good too! Thank you so much! Tree is all a Glitter!! I SENT ONE TO EACH FAMILY..THEY LOVED IT, BECAUSE IT WAS PERSONALIZED!! I gave both of these ornaments for Christmas gifts. One was already received and so admired it! I'm sure I'll have the same response from the other recipient. There's nothing like having something personalized! They are adorable! It's a great keep sake ordiment. A little heavy. I've worked at Miles Kimball for four years and surprisingly have never ordered any ornaments until now, but will likely start ordering some every year considering how much my family loved it when I gave it to them on Thanksgiving. Two of the names were swapped on the ornaments, which I was a little disappointed over as it upset the aesthetics, but overall it didn't affect the ornament much. I am very satisfied with this ornament! I buy a new ornament every year with my name, daughters, and grandson and this is now my favorite one. We have a special celebration every year for our family and I am always looking for a keepsake. This one is perfect. We have a long name so it fits. We have a large family. It's very very pretty. We have an ornament for every year we've been married ..for us and our current group of 5 rescue babies [dogs]..this was very nicely done..good lettering and will become one of our "Treasures"
My sister, her husband and the two kids really like the ornament. The glitter on the ornament was a big hit with adults and kids alike. My son absolutely loves this with it being personalized just for him and his family. My children and GrandBs have unusually spelled names. It is difficult to find personalized items for them. Whenever I find some I scoop up the items immediately. The Glitter tree will be used as a tree topper on my Christmas tree. I purchased one with the kids names and a second with the GrandBs names. Eventually I may get one for each of the kids as an heirloom & keepsake to start their family traditions. The tree is unique in that it is nice to see the family names engraved on it. At first I thought it was a little cartoonish; but it grew on me when I saw it. I will purchase additional trees. 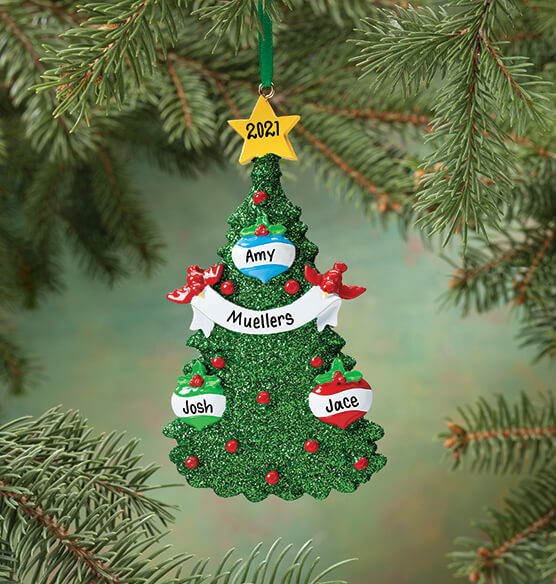 I bought this for my in-laws and put "Grandkids" on the banner, and first names on the ornaments. It was one of the few ornaments that I could put so many names on. I was pleased with the quality and the aesthetics when I received it. It seems very durable, and was of heavier material than I expected, which is great for durability, but could make hanging it a bit of a challenge. Very pleased. The receiver loved it. this ornament was far better than i expected. it was a bit heavy for the tree, but we found a spot. Every year I get a new personalized ornament for my son and his family for their early Christmas present. very attractive and personalized ornament. We buy a new family ornament every Christmas. This glittery ornament is absolutely gorgeous and kudos to the one who did the personalization. It looks so good and we can't wait to see it on our tree this year! I highly recommend this to anyone looking for a personalized ornament for their own family, or to give one to a family as a gift. I was impressed when the item arrived at my house. Gave it as a gift to my daughter and family. They loved it. I purchased this for my son and his family, I buy one every year, was well liked. Each year I purchase personalized ornaments for my 3 great nieces.... Beyond a doubt these are the best!!! They will be so delighted to hang them on their own trees. I can't wait to put this on my Christmas tree this year. I love this ornament. Every year I get ornaments for my family and by far this one was everyone's favorite. This is a gift to our children and I'm sure they will use it for years. The personalization is so colorful. This is a beautiful personalized ornament. Good quality and the printing was very neat!! We give these personalized ornaments at tree trimming time. When the one came without the year you quickly corrected the problem and sent us a new one. Thanks. Bought this for my son and his family for their Christmas tree. I know they will love it. My Daugher is due with my 1st grand Daugher the end of Jan. I wanted something I could put "baby girl" on and this was just what I wanted! 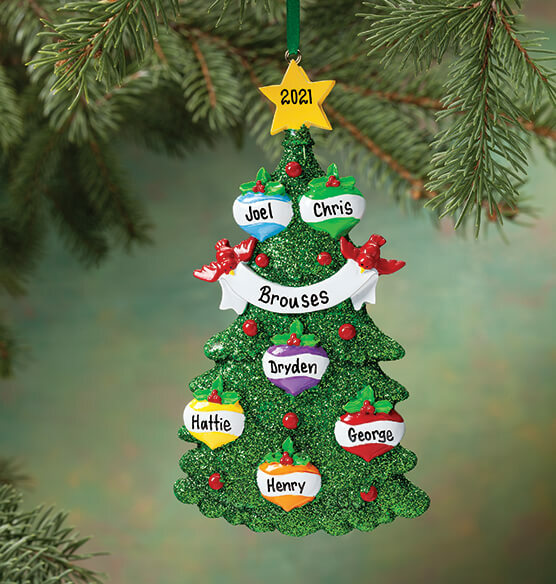 I purchased this for a family of seven at church because it is fairly unique to find an ornament that would fit that many names. This ornament arrived and I was so pleasantly surprised. The names appeared from the top down in the order I entered them, I was hoping but not counting on this, as it doesn't say they will. The father anfd mother's name were on top and the children in order of age from top to bottom with the youngest at the bottom. The printing was clear, the ornament is weighty but in a good way -not heavy. It is not a thin or flimsy ornament. It will hold up for years to come. 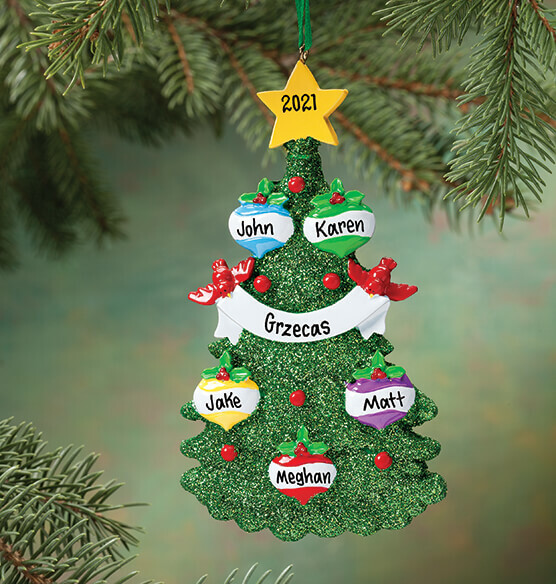 I am very happy and would recommend this to anyone looking for an ornament that can print many names. It was a gift for my daughter and her family. she thought it was done very nicely. I really like the different ornaments you offer, I ordered several last year and I wanted to add to my tree this year with new family members. Original price too high. Waited for after Christmas sale to purchase and had to make it a late Christmas present. Daughter and family awell-pleased with it. No complaints or negatives. Beautiful. 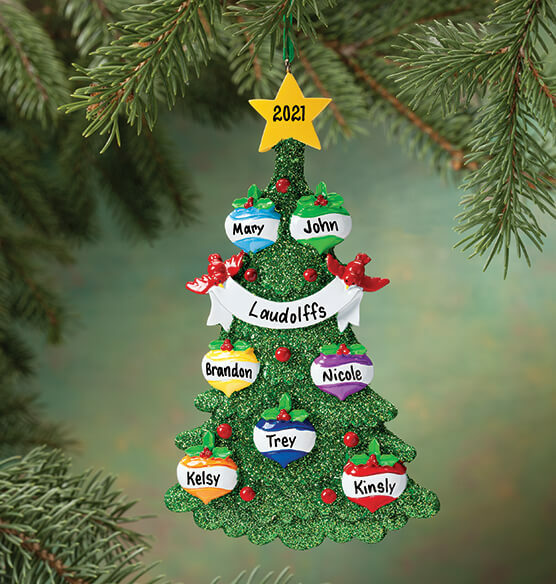 We gave this ornament to our grown children which included their family name, spouse's, and children's names ....They absolutely loved it!!! Got for a gift and am very pleased. we have an annual family cookie swap and ornament exchange every year. This was perfect, it had enough room to list all the last names of the families that were there. EVERYONE wanted it! I had to come home and order 4 more!!! Great way to remember Christmas 2014. Purchased for my daughter and her family. We love ornaments and this one is so unique and fun. Nice to have the year and all the family members listed as a keepsake. I bought two of these for two different families and they came FAST and were impressively lettered and looked to be of the highest quality. I highly recommend these! They are ceramic and the back is white so I wrote a message on the back in permanent ink stating who they were from with love. The Moms who got them LOVED them! I ordered early and was able to bring them at Thanksgiving as an early Christmas gift and/or hostess gift. These ornaments made ME look like the hostess with the most-est! Although this particular ornament was not quite as nicely done as all of the others I have purchased from Miles Kimball, I still love it b/c of the personalization capabilities. My grandson wanted an ornament with all 3 of his cats names on it, as well as the other family members. I remembered seeing this tree that could accommodate all of those names. He and his family loved it and immediately put it on their Christmas tree. They will treasure it for years to come. What a great design for my growing blended family. They will treasure this piece! Name was put on the Purple Ornament!!!!!!! I purchase personalized ornaments each year for my family. I’m running out of options that I haven’t already purchased and this one is unique. Precious tree that celebrates family! It was the only option for a family of 7. Actually found an ornament that will have room for all our names!! Excited to have a family ornament. Price and how cute it is! How do i preview my personalization? BEST ANSWER: Thank you for your question. This ornament does not have the option for the names to be selected on a specific ornament and can not be previewed. We hope this information will be of help to you.